The Next Pagerank Update from Google – Will be Well Received Against Domain Authority? Google’s Pagerank has been one of the main parameters used by the publishers, advertisers and webmasters to judge the quality of the website and the page’s strength based on the various factors that were set by Google. 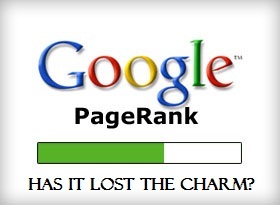 The Pagerank is updated once every few months and that would give the ranking for every web page in the scale of 1-10. Now as we talk about the next page rank update that is expected to happen during the month of May 2013, we need to understand that Pagerank is losing its charm, thanks to the Domain Authority, the new parameter which shows the factors right in front of you to make you understand how strong the domain is. It was during January and February that the first pagerank update for this year happened, and now the expectation for the next update is somewhere between May and June 2013. But as always, it’s not confirmed and one would get to know about it just a couple days before the actual update happens. Now, let’s see what the title actually means to ask! Should you rely on Google Pagerank? Yes, only if you are trying to sell advertisements on your blogs to the clients who would need that as one of the factors to decide whether to advertise on your blog, or to decide the pricing for the advertisement. No, if you are relying on good SEO and content to bring organic traffic to your blog through search engines and have got advertisers who care more about the end traffic and nothing else. But in the end, many of us would try to build page ranks by purchasing links on high PR pages, and that is where the alarmed search engine giant Google would reply back by penalizing the web pages which were promoted through paid links. On the other end, let’s see what Domain Authority is! The Domain Authority is a transparent and a better way right now to judge the strength of not just a particular web page, but the entire domain of the website and this is measured after taking around 150 parameters into consideration. The scale of giving the Authority score is 0-100 and one has to have a better optimized page with good linking to get a better score. My own clients in the recent past have been relying on the Domain Authority and Page Authority for measuring the strength of the page, rather than Pagerank and Alexa (which is still no way a reliable method to assess how much traffic the website receives) which were popular earlier. Of course you would need to pay to unlock all the metrics that are shown by the Domain Authority tools, but still it would show you all the linking, i.e. both internal and external, the social media strength which includes Facebook Shares, Facebook Likes, Tweets and Google +1s apart from the various other stuff which is mostly for the Pro users, but one wouldn’t want to go that deep when they are happy to know what the actual score of the web page is. For now, I would recommend and go with the Domain Authority as the better tool for measuring the strength of a page, and this could surely take away all the concentration from the Pagerank, and these both actually would be in the scene only when the bloggers have the advertisers in mind. If it was the search engine traffic, readers and trust that a blogger needs, ignore the entire post as you are doing a great job already by concentrating on the content and social media promotion and so, shouldn’t rely on this ranking and scoring tools. The next Google Pagerank update could roll out very soon, are you going to look ahead for it or work on your blog for it? Share your opinion in the comments.